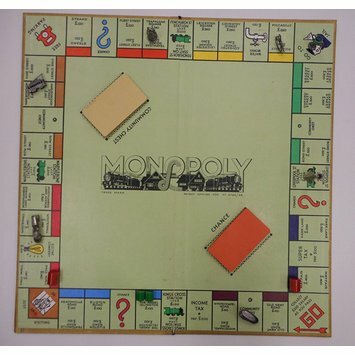 This is a rare Super Gold Monopoly set from 1936, when Monopoly was first manufactured in the UK by Waddingtons under licence from Parker Bros. in the USA. The game box and board have been painted gold, and the now commonly known playing pieces (a top hat, a dog, a wheel barrow, an iron, a boot, a race car, a battleship and a thimble) are instead a 1930s style car, a lantern, a rocking horse, a chalice, a tram car, a candlestick and a bathtub, although the object of the game remains the same. Monopoly is one of the most recognisable games in the world, having sold more than 275 million games since it was first marketed in the 1930s, with specific editions produced for many countries, and many diffferent licenced and limited edition versions having been designed (including Star Wars, Harry Potter and Dr Seuss's The Cat in the Hat). 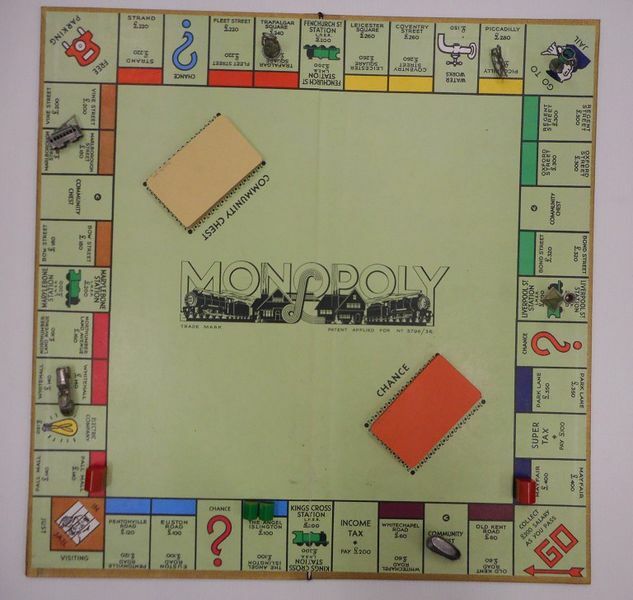 It is well known for its long playing time and current licence owner Hasbro says that the longest game recorded lasted for 70 days, although there are theoretical possibilities recorded on Monopoly fan websites that suggest the game can be won in less than 30 seconds!